What a great weekend at the Libertarian Party of Pennsylvania's convention in Shippensburg, PA! Did you attend and make new friends or gain clarity on a libertarian concept, leadership, or how you can get more involved? If not, you missed out! Libertarian Governor candidate Ken Krawchuk was there advocating for liberty, smaller government, and, of course, the Toast Masters! There were inspiring and informing speakers as young as 17, much older (we won't say how old! ), and ages in between! We even had Libertarian "Not- Presidential" hopeful Adam Kokesh from Arizona not only visit and speak but also join our state party. The Vice Chair debate was another highlights of the first day, with four candidates giving their perspective on the libertarian party, the liberty movement, and how the national can support our state parties. Sitting chair Arvin Vohra and challengers Alex Merced, Joe Hauptmann, and Steve Scheetz were all informed, unique, and compelling. Women were also represented in the audience and with Kathleen Smith, our candidate for Lieutenant Governor, speaking. Michael Heise of Lancaster County, founder of the Libertarian Party Mises Caucus and 2018 US Senate candidate Dale Kerns of Delaware County also spoke and then-Congressional candidate Drew Gray Miller led our fund-raising auction near the end of the day. The first day was definitely filled with a number of opportunities to hear many perspective and updates on the national and state parties and the libertarian movement and culture, too. We also had speaker Carol Kuniholm, chair of Fair Districts PA , update us on state politics concerning district gerrymandering and Jerry Feaser talked about how to work with the local Bureau of Registration and Elections. With both, there was a lot of information on what we can do to help promote policies that support greater liberty and make our voices for liberty heard throughout our state. Over all, it was a liberty-loving, festive day that was also very informative and entertaining. There was also plenty of time for connecting with speakers and other attendees. People are very friendly and welcoming when you talk with them but also will respect your desire to sit quietly in reflection with your own ideas if that's what you prefer. The second day was business. This day was a bit more formal. If you're familiar with the Robert's Rules of Order, you'll have an easier time understanding what's going on and the rules for who speaks when, how, and why. This is the day of focused work - discerning if we'll support certain candidates or not, hearing reports of our officers, and making any other decisions deemed necessary as the day progresses. On this second day, if you are a voting member and relatively new to being active politically, then there's an extra bit of joyful thrill in casting your votes because you know you are participating in supporting liberty with every vote you cast. This can't necessarily be said so consistently at the election ballot when you're voting in other types of elections, so when you have a day where you get to do nothing but be certain that your vote is a clear vote for liberty, it is very heart-warming and thrilling, especially the first time. What rang clear as officers and candidates spoke was that we are at a wonderful turning point. We have a lot more clarity on how we need to organize and present our party more professionally and our leadership is focused and highly motivated. Clearly the members of our state party agreed with their vision and commitment as several members currently sitting on the Board won a second term. Ken Krawchuk (for Governor), Kathleen Smith (for Lieutenant Governor), and Dale Kerns (for US Senate) were officially nominated. In accepting her nomination, Kathleen Smith also affirmed the focus and commitment of our party when she spoke of how she wasn't thinking of running until she saw how organized Ken Krawchuk and Dale Kerns were and what kind of team they had built. Which brings us to you. YOU are a part of this team working for the liberty movement (and hopefully our libertarian party), too. I know you are because you wouldn't be reading this if you weren't. Certainly, the convention is a great way to get tapped into the team for liberty more deeply, get energized on love for liberty, make more liberty-oriented friends and connections, and get informed on what you can do. But, if you missed out on our recent convention, there are two things you can do. First, plan and commit to attending the next LPPA convention. Second, locate your local county party and approach your county chair. Connect and ask what questions you have. See how you can participate in a way that promotes liberty and fits in with your time, talent, and treasure you have because in the movement and party that supports individual liberty, every individual counts. You matter and can make a meaningful contribution that fits with your local party and where you are in life. It doesn't take long to figure out what your bigger and better "fit" is in the liberty movement and it doesn't matter if you contribute in a way that others do or don't. What matters is that you show up because, when it comes to the government we do have, it works for those who show up. So the big question is, how will you show up for your liberty and the liberty of other individuals? Parting thought: along the way, remember to have fun. Life's far too short and too long to work for individual liberty without making it fun. Sonja Dagny Yago is a contributing writer for LPPA, advocate for individual liberty and empowerment, and a mentor-coach for busy emerging leaders, service-based entrepreneurs, empaths, and those with ADHD who want to get more done and have more impact and influence with less stress and more freedom. The Delaware County Libertarian Committee has endorsed W. David Medina to challenge the 162nd Legislative District of Pennsylvania. Medina is an upstanding business owner in Springfield Delaware County, and a resident of Ridley Park. Medina is also a husband and father of two daughters. David was endorsed because of his leadership qualities in the community, his compassion for the less fortunate and the love he shows for his wife and two girls. (Please contact Chairman David Jahn at 610-368-5035 with any questions or comments). W. David Medina is a Business Owner who partners with children and adults on the Autism Spectrum, Asperger’s and Sensory Differences to help them reach their potential. David’s clients have experienced incredible gains in the form of improved strength, balance and confidence. After developing and refining teaching methodologies at Temple University, St. Joseph’s University and Neumann University, training with Grand Masters and former World Champions in the U.S., Canada and Japan and working as an Executive in New York City for a Fortune 100 Company, David knows that success does not come from unproven strategy and tactics. Success happens for those who follow proven principles, systems, and frameworks. David has been interviewed and received coverage in print and broadcast outlets including NBC, ABC News, CBS, Fox News, CNN, USA Today, and Fortune. David is also the author of two Best Selling Books. David holds a BBA in Business Administration from the Wharton School of the University of Pennsylvania, is an alumnus of Springfield High School and lives in Ridley Township with his wife and two daughters. The Delaware County Libertarian Committee strongly supports their candidates who believe in the constitution, fiscal responsibility, and individual rights. With enthusiastic support, we endorse W.David Medina as our candidate in November for the 162nd Legislative District! Libertarians converge on south central Pennsylvania to change the face of the current political landscape. SHIPPENSBURG, PA, March 4, 2018– The Libertarian Party of Pennsylvania (LPPA) held its annual statewide convention at the Shippen Place Hotel. The event was held in order to nominate candidates for state and federal offices, elect delegates to attend the Libertarian Party national convention in New Orleans this June, and discuss various LPPA business. During the convention, three key candidates were accepted as nominees for the LPPA: Ken Krawchuk for Governor, Kathleen Smith for Lieutenant Governor, and Dale Kerns for U.S. Senate. Kathleen Smith is an activist, volunteer, and has fought for quality education for Pennsylvania’s youth over many years. Ms. Smith has been a strong example of leadership to the women of the LPPA since joining. Pennsylvania has more elected Libertarians than any other state as of the 2017 elections, and the LPPA hopes to add a few more in 2018. For more information on the Kerns Campaign visit dalekerns.com. For more information on the Krawchuk/Smith ticket visit kenk4pa.com. The Libertarian Party of Pennsylvania(LPPA) will hold it's annual Convention Weekend at the Shippen Place Hotel in Shippensburg on March 3rd and 4th. The event on Saturday the 3rd will feature speakers and workshops as attendees have the opportunity to interact with libertarian activists from around the state. Registration will begin at 11am with the festivities beginning at noon. Speakers include Elected Libertarians from around the commonwealth; Jennifer Moore (Montgomery County), Demo Agoris (Washington County), Jake Towne (Northampton County), and LPPA Chair Drew Bingaman (Northumberland County). Sharing the podium with the LPPA elected officials will be activists Josiah Strickland (Delaware County), Dan Sullivan (Allegheny), and Andrew Hatstat (Montgomery County) as well as candidates Drew Miller (Congress PA-18), Steve Scheetz (Congress PA-8) Ken Krawchuk (Governor), Kathy Smith (Lt. Governor) and Dale Kerns (U.S. Senate). The LPPA will also host various presentations and workshops from outside organisations. Carol Kuniholm the Chair Fair Districts will speak on the organisations movement on putting an end to gerrymandering in the commonwealth.Jerry Feaser of Dauphin County Bureau of Registration and Elections will conduct a workshop that educates local candidates and county committees on the process of maintaining effective committee reports. Daryn Iwicki of Americans for Prosperity Foundation will present a condensed grassroots activists training class and Scott Horton of Anti-War Radio will speak on his new book Fool's Errand: Time to End the War in Afghanistan. The event will feature an optional buffet meal at 4pm followed by a debate featuring candidates for the Libertarian National Committee Vice Chair position. The debate will focus on the continued growth of the party and what needs to be done to achieve victory in elections and policy changes.Speaking after the debate will be Adam Kokesh author of the book 'Freedom' and a 2020 candidate for President of the United States. The event on Sunday March 4th will serve as the LPPA's annual business meeting and will feature the election of party officers and nomination of candidates for state wide offices. Report of the Chair to the Party Membership. Report of the Eastern VC to the Party Membership. Report of the Central VC to the Party Membership. Report of the Western VC to the Party Membership. Report of the Treasurer to the Party Membership. Report of the Secretary to the Party Membership. Consideration of any other necessary nominations. 6. Consideration of Change to LNC Region status. 10. Any other Business deemed necessary by the Membership. Attendance to both events is open to anyone that wishes to attend but voting ability at the convention is based on party bylaws. Our party is growing. Not only is it growing it is evolving. With new members come new ideas and philosophical discussions. As these ideas evolve we always need to go back to our basic philosophies to keep ourselves from turning into another party intent on curtailing our liberties. It’s a lot of work and it is the right thing to do. For any one new to the party or thinking about affiliating there is the most basic rule. Live and let live. What does live and let live mean really? What Libertarians mean by live and let live is that everyone has the right to live their life as they see fit as long as they are not directly stepping on the rights of others. It is really that simple. You will hear us refer to these violations of rights as using force or fraud or “true crimes”. The more complicated question is what gets in the way of this philosophy that Libertarians can affect? In short, laws. Some laws are good and some are bad. First as Libertarians we recognize that every time a law is created we are giving government the power to apply force on its citizens. A good law will address the infringement of rights by others such as violence and theft. This could be pretty simple but it is complicated by the fact that our country, commonwealth and municipalities have been creating laws and ordinances for a few hundred years now. While some of us would like to just scrap the whole system and start over, we recognize that most of society is not prepared for that at the time being. As a libertarian it is our duty to look at the laws on the books and ask ourselves, “Does this law violate individual liberty”? If it does then it is our responsibility to expand liberty by taking action to get bad laws and ordinances off of the books. That last statement might seem a little overwhelming at first but it is easier than you have been led to believe. If we look at the laws and ordinances that get in the way of Liberty you will find that the majority of them are at the local and Commonwealth level. That is good thing for two reasons. The first is because of the 10th Amendment. The second reason is because your Commonwealth and Municipal Representatives are easily accessible and we all should take advantage of that accessibility as often as feasible. Make a call, set up a town hall about a pressing issue, or show up to township or school board meeting. On a side note, I did not quote the 10th amendment because it is your duty as a Libertarian to be a good steward of the freedoms our Constitution protects. If you are an aspiring Libertarian consider this a homework assignment. What is fraud? Quite simply it is being intentionally deceitful for personal or professional gain. In the Libertarian view if and individual, group or government intentionally misrepresents themselves in a contract with others, that is fraud. Hence, that the individuals’ constitutional rights to life, liberty and property were taken from them without due process. Violating a contract (e.g. rental agreement, purchase agreement), unjust incarceration and emanate domain acquisitions are common examples. We consider these examples of force and fraud true crimes and advocate that the punishment fit the crime indiscriminately and equally irregardless of any societal status. That is a subject in itself I will address in depth in another article.For any future affiliated Libertarians I hope this answers some questions. For current Libertarians it is important that we dispel the myths thrown upon us. Spread the word of liberty. Pittsburgh – January 8, 2018 – The Libertarian Party of Allegheny and Washington Counties unanimously nominated Pittsburgh attorney Drew Gray Miller to be the Libertarian candidate for the 18th Congressional District Special Election taking place on March 13, 2018. The seat became vacant upon the resignation of Congressman Tim Murphy. Drew Gray Miller, a political centrist, will offer Southwestern PA voters a third party option for those seeking a fiscally conservative, socially liberal candidate, and an alternative to the divisive politics being pushed by the Republican and Democratic politicians. As former Legal Counsel to the Majority Whip of the Pennsylvania Senate, Miller gained experience in navigating the complex intricacies of government agencies – resolving an average of 1,000 constituent issues per year – and researching and drafting legislation, making him the only candidate in this 18th Congressional District race with both a legal background and legislative drafting experience. Miller is also an experienced, passionate community leader, serving as Board President of one of the largest human services organizations in Pittsburgh, where he advocates ending homelessness and hunger. When elected, Drew Gray Miller will work to serve the needs of the 18th Congressional District, forging community-focused, fiscally responsible solutions while minimizing government interference in citizens’ private lives. These days, people are so strongly polarized on key issues that attempts to discuss those issues often escalate quickly to acrimony. Even good friends and families learn to avoid certain topics so as to keep their gatherings cordial. This certainly is uncomfortable, and it definitely impedes making progress toward resolving such issues. The intense polarization in our society has reached unhealthy and perhaps unprecedented levels. What might be done to defuse this serious problem? When two individuals or groups disagree about something, there are only three things they can do. First, they can “agree to disagree” and walk away. This may occur after a little or a lot of unproductive argument. Of course, the issue has not been resolved and will return to haunt. The vast majority of disagreements follow this course of inaction. Second, the stronger side could use force to impose its view upon the weaker side. The weaker side may still harbor its “incorrect” (now repressed) view, so a longer-lasting resolution may require “elimination” of the weaker side. History is replete with examples, ranging from two-person duels to persecution, religious crusades and wars. Third, both sides could agree to settle their issue or issues by employing rational thought. This is the only path guaranteed to actually resolve an issue — that is, both sides end up in agreement — and to resolve it peacefully (with zero use of force). As a prerequisite, all parties must be cognizant of the demonstrable fact that there is a single objective reality that is the same for everybody. With some work, we can discover and understand many of the basic principles that govern our reality. Building upon basic principles with sound logic, we can deduce higher-level conclusions regarding how things work. This process is often complex, and conclusions can sometimes be counterintuitive. If two parties disagree about some aspect of reality, they can’t both be right. Of course, they might both be wrong, but at most one of them can be right. The beautiful thing is that any such dispute can substantially always be cleared up peacefully and conclusively. Cooperatively, both parties can go back to basic principles and review each logical step (correcting any mistakes) until a conclusion is reached. Both must then agree with that conclusion. Additionally, a test might be devised to prove which conclusion actually is consistent with reality. Such a test or logical process can be duplicated by any rational person anywhere to verify the result. Should verification fail, we know we must look for the mistake(s) in the (current or original) test design or logic. For complex cases, this could indeed be a long, arduous process. It’s probably obvious that the above describes what is commonly called the scientific method. Undeniably, rational thinking in the scientific disciplines has demonstrated spectacular success and has produced fantastic benefits. But rational thought does not just apply to science. It is universal and applies to everything everywhere. There is no boundary walling off science from everything else, within which rational thought applies and outside of which it does not. Of course, we cannot settle differences in personal preference (you want to paint the room blue, but your partner likes green). We deal only with disputes over our shared reality (increasing the minimum wage will/will not increase unemployment). Most people just don’t know much about rational thought. The fact that schools seldom specifically teach and don’t consistently emphasize these fundamentally important concepts is one obvious cause. Being surrounded by others in the same boat doesn’t help. Of those who vaguely recognize that rational thought is important, many will have nothing to do with it. “That’s just scientific stuff, and science is not my thing,” is their excuse. Of the dwindling remaining group who do understand the concept and its importance, few apparently are willing to put forth the required effort. Digging a ditch by hand is hard, physical work. Rational thinking usually is equally difficult mental work. You must focus hard on a thorny problem for a sustained time and commit to carefully reasoning it all the way through. In our age of flashing screens and short attention spans, vanishingly few are able and willing to tackle the hard work of rational thought. So, sadly, there are precious few consistently rational thinkers. Overwhelmingly, people have little appreciation for basic principles. They adopt issue positions fairly indiscriminately — because it “feels” or “sounds” right; it’s what their friends think; their church or political party told them so; even just because they heard it 50 times in a catchy sound bite. Or they are willing to believe things as a matter of faith, which by its very definition is not rational. If peace on earth is ever to be achieved, less irrationality and more rationality will be necessary. Until we have more rational thinkers, or at least more people who appreciate, respect and value the process, we’ll continue to have lots of strong polarization, irrational shouting, acrimony and unresolved issues. Roy Minet, a Mount Joy resident, was the Libertarian Party’s nominee for Pennsylvania auditor general in 2016. I challenge everyone who links themselves to a political party to a little thought experiment. Unplug your thoughts from your party’s platform and don’t think about the talking points spewed by political pundits and politicians. Stop and think about what you believe. What are your core principles? What is the role of a government? How much or how little should we be taxed? How should those taxes be spent? Do you believe in people’s First Amendment rights when they oppose your views? Think about our current wars, marriage rights, security, NSA spying, government whistleblowers, net neutrality, etc. Think about where you stand, not your party. Once you have rethought your principles, honestly evaluate your party’s recent actions and decide if they really align. If you’re like me, you realize that the party you have aligned with for the past 10, 20, or 30 years no longer stands for the same principles that made you align with it at the start. In my lifetime, the Democratic Party has shifted from a party of free speech and anti-war principles to one that tries to silence conservative voices on college campuses and has supported a presidential candidate who voted for or supported every military action in the past 20 years. The GOP has gone from the party of small government and reduced taxes to a party that created the largest domestic surveillance program and out-of-control federal spending with no genuine effort to cut taxes. I could list a dozen other issues on which both sides have flipped. Regardless of which party you have supported in the past, if that party does not match your views, you need to stop supporting it. Look to alternative parties that match your principles. In this area, you can find Libertarian, Green, Constitution and Socialist parties all looking for support, or you can opt to be a registered Independent and not support any party. But please stop supporting these two parties out of loyalty for “your team” and find a team that deserves you and represents your principles. This proposal specifically schedules for the weekend before the signature collection season starts so that our nominees have no loss of time in that process. The social/training day would be similar to the PA Leaders Forum held by an outside group last year. Each County Affiliate with a board vote(13) would be allotted 20 minutes for a presentation or speaker of their choice. We will also be looking for a maximum of 3 headline speakers. Those speakers will have any associated costs paid for by the members that wish to bring them to the social/training event. The Saturday event will open at 12 noon with the first group of speakers running from 1-4, there will be free time for dinner from 4-6, and then we will have the remaining/headline speakers from 6 til 9 with time after for socializing at the venue and hotel bar. The business meeting on Sunday will open at noon and will be organized by the chair and secretary as dictated by the bylaws. Rooms start at $70 at hosting hotel and are rated as 4 star and above on all rating platforms. Bar/Restaurant located in Hotel, multiple other bars and restaurants in general area. Redistricting reform is a hot topic in Pennsylvania right now. The League of Woman’s Voters of Pennsylvania filed lawsuit in June that the gerrymandering was so blatantly partisan that jeopardizes our Democracy. The Libertarian Party of Pennsylvania could not agree more. On Saturday November 18th we put the issue to a vote at our quarterly meeting. The motion was submitted that the LPPA should endorse the League of Woman’s Voters in their lawsuit. The motion was passed and we are currently reaching out to the LWVPA. Some may be asking why the Libertarian party has an interest. Our interest is simple; redistricting reform will give minor parties an equal chance to earn your vote. Gerrymandering is legal voter fraud. Gerrymandering is designed to allow legislators to pick their voters rather than voters picking their legislators and as long as legislators can disguise their intent, it is legal. If the vote gets too close the party in power will redraw the lines based off of the data from the last election. The major parties keep track of how many votes came from what Counties, Townships, Burroughs, zip codes and neighborhoods and they legally use is when it’s time for redistricting. The original intent of redistricting is to protect voter representation. People move, populations grow and decline. Redistricting is required to make sure we are equally represented based on our population. The current process of redistricting is a behind the scenes closed door system. That does not support the Libertarian principle of protecting individual liberty. The Libertarian Party of Pennsylvania supports the “Fair Districts PA” movement. There are a handful of bills that were submitted this year for redistricting by liberty minded Representatives and Senators. Fair Districts promotes SB22 and HB 722 respectively. We support these Bills because they require redistricting be open and transparent. Most importantly these Bills require that 3 of the 11 members on the commission be completely independent of the 2 majority parties. Those 3 (immediate family and/or spouse) cannot have been elected to any office, have been a staff member, consultant, lobbyist, have even been nominated for an office or have been registered of 2 majority parties for the last 5 years. On an 11 member commission the two majority parties each have equal seats at the table. If partisanship prevails, we will have a truly independent element to protect us. These Bills safeguard our Liberty and protect Pennsylvanian’s voting rights. Contact your Representatives in support of Fair Districts PA and the LWVPA lawsuit. If you have questions about the Libertarian Party of Pennsylvania, contact your Libertarian State or County Committee. 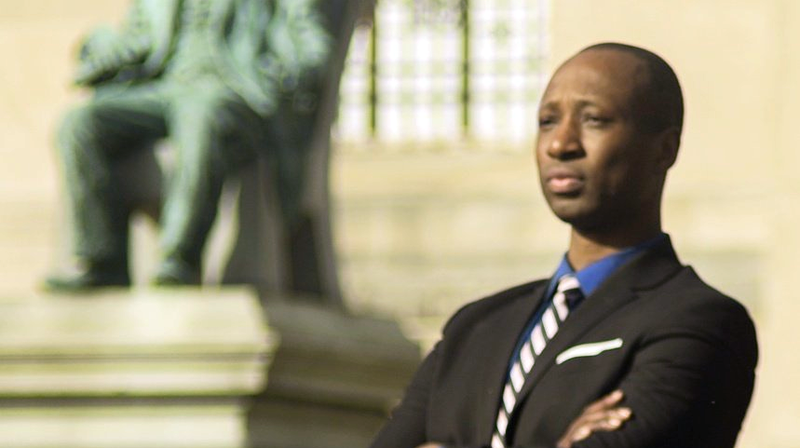 Property taxes in Scranton, Penn., will be lower thanks to Gary St. Fleur, the city’s Libertarian mayoral candidate, who won a major court victory for the city’s taxpayers on Oct. 18. Lackawanna County Common Pleas Court Judge James Gibbons made a final ruling that the city of Scranton must follow the Act 511 requirement for cities to cap property taxes at 1.2 percent of property valuation. St. Fleur joined seven other Scranton taxpayers in March to file a lawsuit protesting the illegality of the city’s property tax hikes, and this new ruling vindicates their hard work. St. Fleur contends that Scranton is in severe financial distress and there is practically no recourse left except for the government to file for Chapter 9 bankruptcy, and he has initiated a ballot measure that would allow citizens to force the city’s hand. An October 2016 Wells Fargo report explains that a 2014 audit of Scranton revealed $375 million in liabilities and $184 million in unfunded non-pension post-retirement benefits to government employees. The city has had to sell various public assets, such as the sewer authority for $195 million, and issue “junk”-rated bonds in order to maintain its revenue stream. St Fleur is adamant that lowering taxes across the board is the only way to Save Scranton from its economic depression. “Bankruptcy would lessen the city’s financial burdens,” he said, which would make it possible to decrease taxes.